These specialty 5.56mm NATO rounds from Barnes were designed to appeal to the demanding needs U.S. military snipers and designated marksman units. 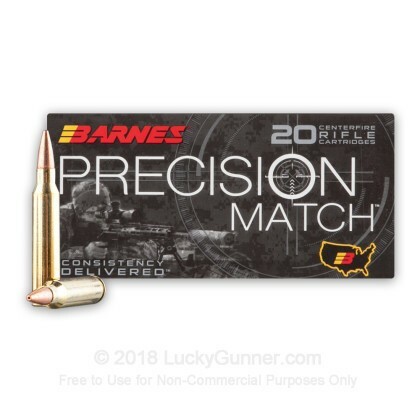 The "Precision Match" line is intended to provide the same incredible accuracy that Barnes bullets are known for but in a "full-up," ready-to-shoot package for those that don't care to do their own handloading. These rounds are made up of high quality components including fresh factory brass, clean-igniting primers, and carefully engineered propellant. Each cartridge is crowned with an 85 grain projectile which possesses an open tip and a boat tail rear for ultimate drag resistance that contributes to tighter groups on target. 85 grains is quite massive for the 5.56x45mm caliber and should only be used with barrels of 1:8 or faster twist rate; this heavy profile gives the bullet a longer body for increased surface area to contact rifling and generate greater stability. That makes these rounds suitable for long range tack-driving as well as competitive use. For over 80 years, Barnes has held a reputation for producing some the finest projectiles available in the U.S. market. Their creative design process has yielded a variety of ammo types which answer specific problems in law enforcement, extreme distance hunting, and competitive sniping challenges. 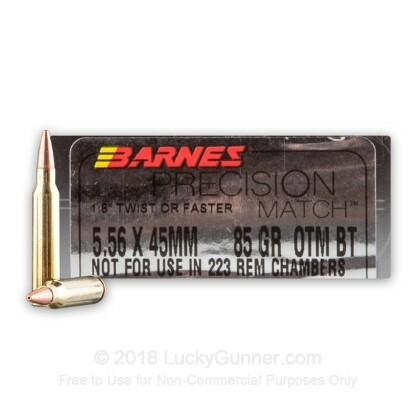 We don't have any reviews yet for this particular 5.56x45mm ammo from Barnes. 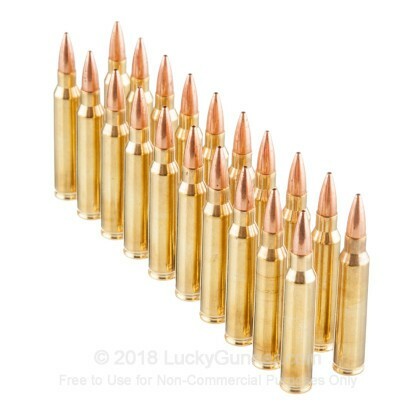 If you'd like to be the first to review this particular 5.56x45mm ammo from Barnes, fill out the form below. Q: Is the heavier projectile what I should employ to defeat gusty wind conditions? A: A heavier bullet will resist the wind slightly better. The other factor that would help would be higher velocity. This velocity is a tad on the low side at 2600 fps. But that is to be expected with such a heavy grain weight bullets. 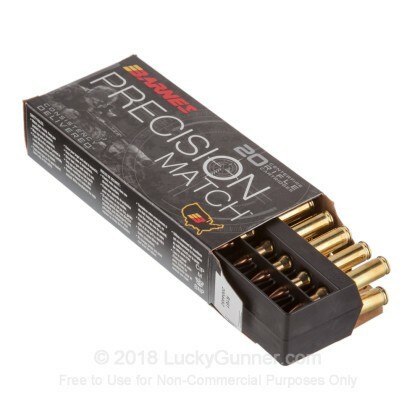 Q: Other sites have these listed for match shooting and deer / hog hunting so you don’t recommend the 85 grain for hunting match shooting only? 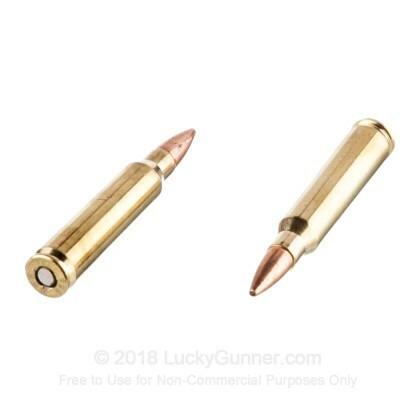 Do you recommend the 70 grain Barnes for hunting if not the 85 grain? A: I would not personally recommend this projectile for any game animal. It might work, but there is certainly better out there. This bullet is designed to fly straighter and further and produce tighter groups, with very little regard for how much energy it strikes the target with. It is also not optimized to cause the catastrophic damage necessary to humanely kill a game animal. It is simply not designed to "mushroom" or expand like many of the other bullets. The 70 grain TSX is however designed to offer great accuracy and good groups, but sacrifices just a bit of range to be able to deliver a devastating wound to an animal and cause the kind of damage necessary for a humane quick kill. If you have any further questions about round selection or usage, please let us know. We are here to help. Q: Will these fit in a standard Ar-15 Magazine? A: These will fit in a standard AR pattern magazine. 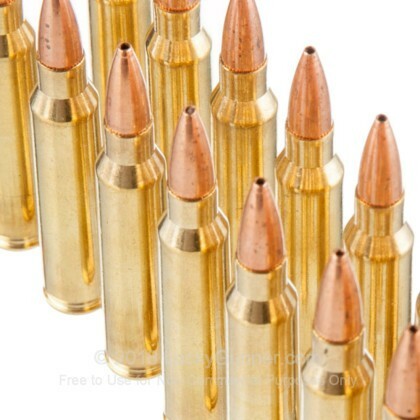 The bullet itself is whats heavier the completed cartridge is dimension-ally similar to all other 5.56x45 cartridges. A: Great question. 223/5.56 might be a bit on the small side for Antelope, depending on where you take your shot from. While those 85gr rounds you're looking at are excellent for long range target shooting, they are not designed for hunting. They will not expand reliably like a purpose-built hunting round will. If you're planning to go hunting, I would stick with something like 64gr Winchester Power Point or 64gr Federal Powershok. A: No, these are not lead free rounds.